Product #60510 | SKU 8-ASHINOBI C+SH KIT | 0.0 (no ratings yet) Thanks for your rating! The lightweight and durable cage helps you to protect your monitor, easily accessible plugs, sockets. The Sunhood prevents glare. 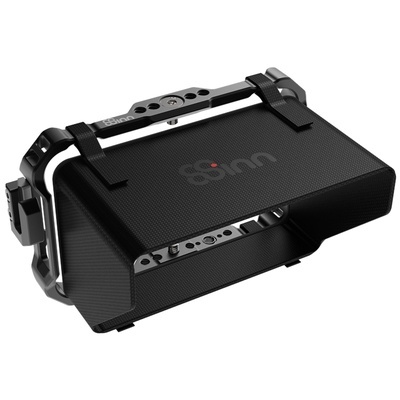 Using your Atomos Shinobi with the 8Sinn Cage will help you to protect your monitor and to develop its capabilities. This frame-like cage has been carefully designed so that not to interrupt the monitor`s structure. It has been cut out from one piece of air aluminium, which makes it lightweight and durable at the same time. Top and bottom side of the cage serve as built-in NATO rails - standard solution for quick-release accessories. Every plug and socket is easily accessible. Additional 1/4" mounting points can be found on top and at the bottom of the cage, which are useful for extra accessories. Cage is attached to the monitor by two 1/4" screws (top and bottom). Bottom of the cage includes the 1/4"-3/8" reduction screw. When the reduction screw is inserted, the mounting point is 1/4", when reduction screw is unscrewed the mounting point changes into 3/8". Thanks to dedicated openings at the bottom, the Shinobi cage can be used with ARRI standard accessories equipped with anti-twist pins. The extra HDMI protective cable clamp - prevent the cable from being accidentally disconnected. The 8Sinn Sunhood for Atomos Shinobi Cage is a form-fitted sunhood for Atomos Shinobi/Ninja V Cage. The hook-and-loop straps are easy to assemble and disassemble. It can be connected with the cage closely to prevent glare, and maintain image contrast under bright sunlight.